The man calling at the consulting rooms of the eminent Hertfordshire physician, Thomas Dimsdale, on an April morning in 1768, seemed out of place in the village of Bengeo. His flamboyant appearance and long beard marked him out as a foreigner, which indeed he was, for he was a special envoy from the royal court of the Tsarina, come to persuade the doctor to travel to St Petersburg to attend on Empress Catherine the Great of Russia. Thomas Dimsdale was no ordinary physician. He was renowned for his method of variolation – immunising a patient against smallpox (Variola) by deliberately infecting them with fluid from smallpox scabs taken from a patient with a mild form of the disease. The resulting smallpox infection then occurred less dangerously than if contracted by natural means. Dimsdale was not the pioneer of this technique, he had copied and improved on a similar procedure by Robert Sutton in Essex, who despite a lack of medical qualifications had achieved great success in inoculating patients. After studying Sutton’s methods, it was Dimsdale’s treatise, The Present Method For Inoculating For The Smallpox, published in 1767, that spread the knowledge in medical circles, earning him acclaim – as far as Russia. The Russian Ambassador to England had taken news of Dimsdale’s successful procedure to the Russian capital, St Petersburg, and to Russia’s ruler, the Tsarina. The rapidly developing, highly infectious disease, characterised by fluid filled bumps all over the body, occurred in devastating outbreaks, killing around a third of those who contracted it. Soon after she became empress in 1762, Catherine had been shocked by the horrible death of her foreign minister’s fiancée, Countess Sheremetev, of smallpox. Moreover, the disfiguring effects on her husband, Peter III, whose appearance she described as ‘quite hideous’, and the death of 20,000 of her subjects to the disease in one year, brought home the horror of this killer. Catherine’s was desperate to have herself and her son, the Grand Duke Paul, as well as her subjects, inoculated against the disease and was prepared to act as guinea pig. Dimsdale was an independently wealthy, respected 56-year-old physician and a man driven by his Quaker faith. Yet despite the honour of attending on perhaps the most powerful woman in the world, Dimsdale was not inclined to say yes, and it took a second envoy in July 1768 and payment of £1,000 to convince him to undertake the hazardous 2,000 mile journey to St Petersburg. On July 28, 1768, accompanied by his son, a medical student at Edinburgh University, they set off for Russia. After a month travelling via Amsterdam, Danzig and Riga they arrived in the Russian capital and to their shock were placed under what appeared to be house arrest in a large mansion close to the Royal Palace. Given his initial reluctance to accept the mission, Panin’s ‘welcome’ must have caused the physician to reflect on the enormity of what lay ahead. On his fourth day in the capital Dimsdale was summoned to a private audience with Catherine at her summer palace at Pushkin, south of the city. The meeting went well and Dimsdale was beguiled by her, calling her ‘most engaging’. He discussed the process of inoculation and the empress responded by ‘asking intelligent and penetrating questions’. Dimsdale suggested to the Tsarina that she allow her own physicians to assist him (and perhaps to take a share of the blame should anything go wrong) but she refused. ‘My life belongs to me,’ she said, ‘and I have great pleasure in entrusting it entirely to you.’ Despite his anxiety, Dimsdale bowed to the Tsarina and promised obedience. In the late evening of October 12, 1768, Dimsdale was summoned to the Winter Palace in St Petersburg. He had earlier inoculated a young peasant boy, Aleksandr Markov, with the smallpox virus to provide a fresh sample for the Tsarina’s procedure. In great secrecy he was escorted to the empress’ bedroom. He made a tiny incision in each of Catherine’s arms and placed in each cut a scraping of smallpox fluid taken from the peasant boy’s scabs. The next morning the Tsarina departed for the Summer Palace where Dimsdale supervised her convalescence. A few days after her arrival, she developed a fever and pains in her body and smallpox pustules began to emerge on parts of her body. Dimsdale noted in his journal that the Tsarina had provided him and his son with passports and a coach with fast horses standing by, just in case things went wrong. He may or may not have known that a previous Tsar, Ivan III, had executed two German physicians whose royal patients had died. None of the precautions were necessary. 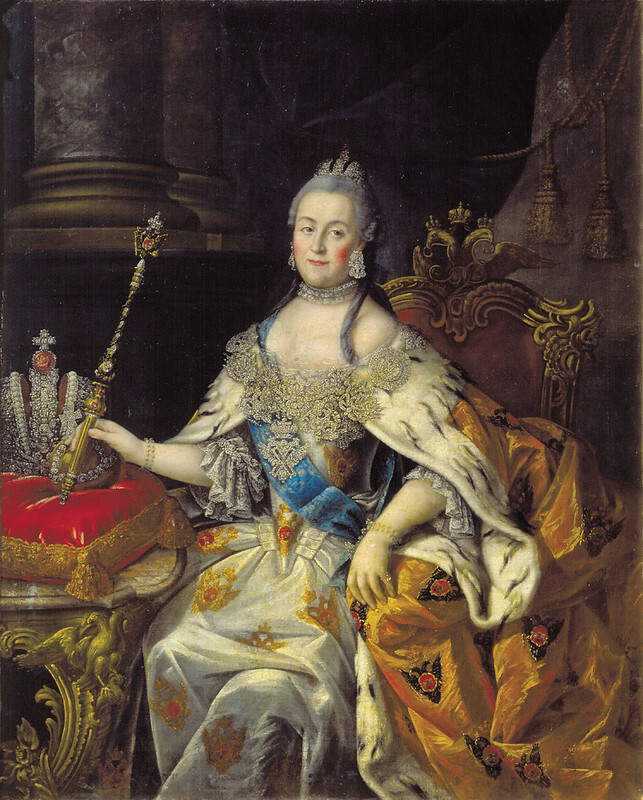 By the end of the month Catherine had recovered and returned to St Petersburg. On November 2 Dimsdale inoculated the 14-year-old grand duke who also made a complete recovery. When news of his success became public knowledge at the Russian court, the nobility rushed to copy the Tsarina’s example. In the next few months, the height of the freezing Russian winter, Dimsdale inoculated more than 200 nobles and royal officials in St Petersburg and Moscow, all of whom recovered. Dimsdale instructed Russian physicians on his techniques and established inoculation hospitals in both cities. Gold medals were struck by the Russian Mint to commemorate the royal inoculations bearing the inscription, ‘She saved others to the danger of herself’. The young peasant from whose arm the smallpox virus had been taken was made a noble for his role in the procedure. Even as Dimsdale was teaching Russian physicians however, a new epidemic was tearing through the Russian countryside. The gratitude of Catherine for Dimsdale’s work was deep. She made him a Baron of the Russian Empire and awarded him £12,000 and a pension of £500 per annum for life. He was also presented with diamond encrusted portraits of herself and her son and made a royal counsellor. One grateful Russian nobleman presented Dimsdale with a bag of gold, which the doctor found too heavy to carry. In all, he was paid today’s equivalent of £10m for his work in Russia. The gifts lavished on Dimsdale show not just how grateful the Russian court was but also how much they feared the deadly effects of smallpox. Baron Dimsdale returned home to Hertford in 1769 to continue his medical practice in the town. He would return to Russia one final time in 1782 to inoculate the grand duke’s two sons, Aleksandr and Konstantin. At home, Dimsdale was made a Fellow of the Royal Society and stood successfully for parliament in 1780 and 1784. He invested his wealth in a private bank but soon formed his own, Bank of Staples, Baron Dimsdale and Son, in London. Although he had consulting rooms in Hertford, Dimsdale’s home was a short distance away at Port Hill House in Bengeo, which locals called The Inoculation House. Adjoining his property, in 1763 he built an isolation hospital on the corner of Byde Street and Fanshawe Street to isolate patients from the community until they had recovered from the inoculation. It is still called The Old Pest House, a reference to a time when smallpox was known as ‘the pestilence’. By the time of his death, aged 88, in December 1800, medical science had improved on his work, and Dimsdale found his technique of variolation superseded by Edward Jenner’s 1796 process of vaccination – a process that took samples of a similar but less deadly disease from a cow (the Latin root vaccinus means ‘of a cow’) after he observed milkmaids who contracted cowpox did not later catch smallpox. Dimsdale is buried with family in the Quaker’s burial ground in Bishop’s Stortford. In St Andrew’s church in Hertford a simple marble plaque honours this leading figure of 18th century science who could be called the world’s first biotech entrepreneur. His work in the field of immunisation played a key part in the final global eradication in 1980 of one the biggest killers in human history.